Geoff stopped by this morning to say goodbye, they were going to make the most of a bright crisp morning and head out of town. Our paths may cross later in the year when we both head southwards. Some of the morning was spent taking photos of my latest makes for Etsy and uploading them to social media, by the end of the day I’d sold another item and possibly have a new commission, more money for the wine fund! After lunch we walked up into town, there were a few bits we wanted which I hoped we’d find in Victoria Market. This is situated on the top floor of Intu where John Lewis is. Despite there being quite a few empty stalls, especially in the meat and fish section, there was still a good selection. We found our way to Aladdin’s Cave, which had one of the items on our list. Here they sell all sorts of bits and bobs that would need quite a rootle to find the thing you need, but worth a visit for that curtain track fitting nobody else has anymore. Then on to Wilko for most of the remainder of our list. Wandering around the streets of Nottingham you see also sorts of wonderful Victorian buildings. Today one stopped us in our tracks and deserved a closer look. 17 George Street was designed by architect Watson Fothergill in 1895 as offices for himself, above the door it says as much. Built in the Gothic Revival style this elaborate building shows off the architects style acting as a three dimensional catalogue. Details include terracotta panels depicting Classical, Medieval and Elizabethan building construction; busts of architects who influenced Fothergill’s style (including Pugin); and a beautiful ornate oriel window. Watson Fothergill was a local architect, his stamp can be seen around the city, but not too much further afield. A turning lorry in 2015 badly damaged the oriel window. Bonsers were called in to do the rebuilding and conservation works to return the building to its former glory. They did a very good job, if I hadn’t found the article I’d never have known. Back at The Broadway Cinema to use our £5 vouchers to see Stan and Ollie. We had our free cuppas in hand and found good seats all the time being played the Laurel and Hardy theme tune, with this playing round our heads we wouldn’t take our time getting back to the boat later. What a lovely film. Funny and touching. The performances are very good. Steve Coogan as Stan is superb all the mannerisms perfectly done. John C Reilly is also great as Ollie. 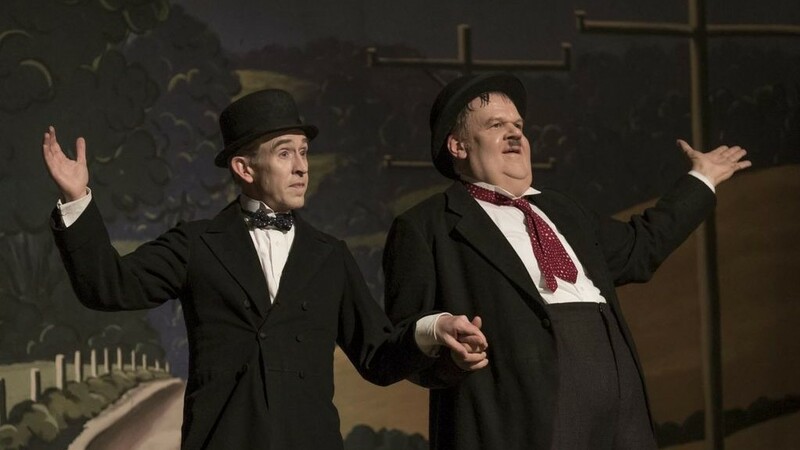 The film covers a grueling music hall tour that the ageing comedy duo undertook across the UK and Ireland in 1953 as they struggle to get another film made (a comic adaptation of Robin Hood, quite apt for us). Lack of publicity means they play to almost empty houses at the beginning of the tour, people thinking they have long since passed away. It focuses on their personal relationship and has some wonderful scenes from their show, the double door routine is very funny. So well worth us coming back to see it, especially for £5 each. 0 locks, 0 miles, 5 litres damp crystals, 6 fat balls, 3 sachets descaler, 1 block sawdust, NO 17, £5 tickets, 2 great performances, 1 more nice mess, 2 giant crochet baskets, 1 sale, possibly another. This entry was posted in Uncategorized on 24th Jan 2019 by pipandmick. Hi Pip, I've been looking for an easy watermark for my photos since starting with an Apple Mac so have just tried the WaterMarquee. It seems very slow and 'jumpy' but won't show my text – any tips you can give me please? Thanks Pip, that'll be both of us looking for the same thing!